I corrected him & spelled out my boss’s last name. When he said that, we both laughed & I was more at ease. Right then & there we had a connection. He automatically scored some points with me by being able to relate to me & my kind. Don’t you know the Lord already knew how receptive people would be to what was happening if they knew the disciples “got” them & who they were? I love feeling a part of something. I think they did, too. It’s just human nature to want to be included. When the crowd of people heard the disciples in their language, don’t you know they must have finally felt the message they were being brought were from qualified people that understood them? Oh yeah, you had the skeptics trying to throw a spoke in the wheel by saying they were drunk. (verse 13) Ain’t there always some of them everywhere you go? Thank goodness God’s plan was carried out flawlessly. After listening to that message, there were baptisms and sins forgiven and people saved in the number of about 3,000 souls! (verse 41) All because they felt like they were listening to people who they were in favor with. Don’t you know that made them feel good? Like chocolate gravy & biscuits good! I am so glad you came by to visit with me today. The sun is shining on Northeast Mississippi right now. I am loving it! I hope you stop back by soon. As for me, I have to be going because I should be washing clothes. 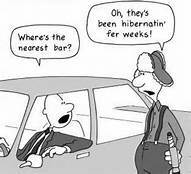 If you are Southern, you will completely understand this comic & you will wonder is it supposed to be funny? Because, it seems like this guy is looking for wildlife to me.